The Bryant Park skating pond tree gets a lighting ceremony too, you know. TREEDUX: Why should the Rockefeller Center tannenbaum get all the accolades? 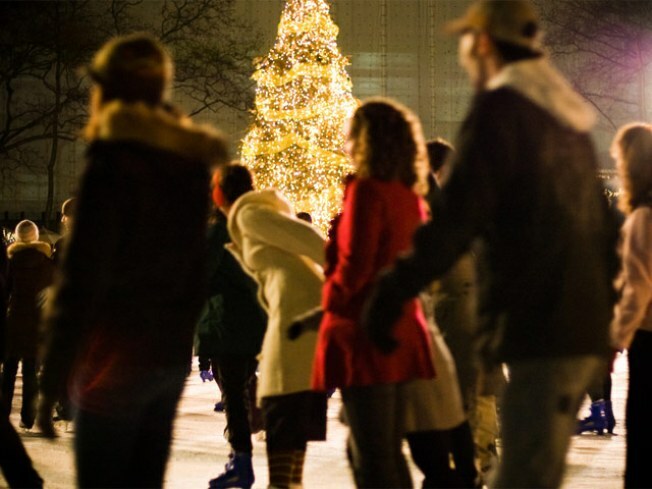 At Bryant Park’s tree-lighting ceremony, there may be no Aretha in a fur muff, but you'll get live music from the Jazz @ Lincoln Center folks, choreography on ice at the Pond and plenty more. Bonus: Fewer crowds! 7PM. GIRLS’ NIGHT: Quirky songbird Erin McKeown (who, at age 31, has already released 6 LPs and 2 EPs, just in case we weren’t feeling lazy enough) comes to the Highline Ballroom accompanied by Denver-born songwriter/guitarist/singer Jill Sobule, whose stellar career includes having been the first ladyartist to record a song titled “I Kissed a Girl”. Fear not: The name of their tour -- "The Clash Of The Legends" – is very much tongue in cheek. 8PM. RHYMES WITH ORANGE: We owe a lot to Stanley Kubrick’s “A Clockwork Orange”: a certain mod aesthetic, the resurgent popularity of bowler hats (we’ll also give that to “Cabaret”), and the inability to ever listen to “Singin’ in the Rain” the same way again. If you don’t get that last reference, then you really need to see the movie, playing tonight and tomorrow at IFC Midnights as part of the Kubrick Masterworks series, 12AM.